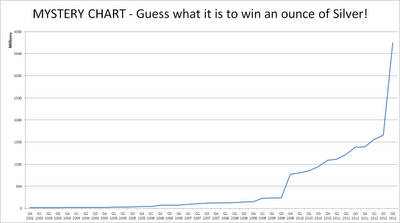 Mystery Chart: Guess what it is, win free Silver! I have constructed the below chart with some data I collected this evening. I am putting out a challenge to any readers who are interested in winning some free Silver. 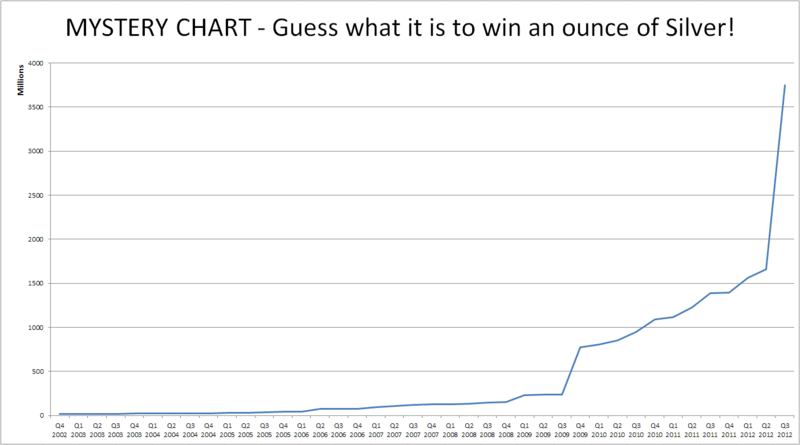 Guess what this chart is (answer has to be specific) and I will post you a free ounce of Silver (you will get a choice from a few nice coins). Only the first person to guess will win the Silver. Will post worldwide. No maximum number of entries so you can keep guessing, but only 1 guess allowed per comment (so if you want to make 3 guesses then they need to be in 3 separate comments). Only entries in comments section of this blog will be accepted. Important: You need to post your entry to the blog with an account (leave an email address in the comment or use a username that you use on a forum like Silver Stackers or Kitcomm) or I will not be able to contact the winner. I will give out some clues over the next couple of days (will update the post) and probably close this off Sunday afternoon/evening if no one has guessed correctly (and I will keep my ounce of Silver). I will tweet any new clues (once posted on the blog) so follow me on Twitter (@bullionbaron) for notification of updates. The first clue: I am finance/market related. Just because the number rises doesn't mean my owners wealth increases. Friday Morning Clues: I've had a couple of suggestions that it could be the Fed or another central bank balance sheet. While that fits the theme of the first clue it's not a central bank balance sheet. The number set that is charted starts around 20 million and recently almost doubled to a little under 4 billion. Question: Is it precious metals related? Answer: A good question to narrow it down. Yes it is precious metals related (more info in afternoon clue). Number of gold mining co shares issued. On the ASX I guess. I don't follow the penny stocks, hopefully they had lots of placements this year. As per above, I need specifics (company name)... but the above should help considerably to final answer. The answer was guessed correctly by euphoria, it is the issued shares over a 10 year period for Gold Anomaly Limited (GOA) on the ASX. I will put up a post later tonight or over the weekend with more information. But it's something to think about in the meantime. Some of these small cap mining stocks are better scrip printers than Bernanke himself. You can also ask questions in the comments section to try and narrow down where to look for the answer. It's very unlikely you've seen this exact data charted before. So put your thinking cap on and start guessing below! Resource Companies Print Shares Like Bernanke!